Be the first to share your favorite memory, photo or story of Presley. This memorial page is dedicated for family, friends and future generations to celebrate the life of their loved one. 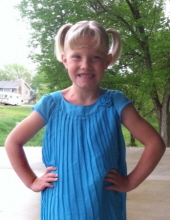 Presley Paige Nielsen, age 5, of Hartford, SD passed away Saturday, July 18, 2015. Mass of Christian Burial will be 10:30 a.m. Thursday, July 23, 2015 at St. Mary’s Catholic Church, Clear Lake, SD. Burial will be in the Blom Prairie Cemetery, rural Toronto, SD. Visitation will be Wednesday, July 22nd from 4:00 p.m. – 7:30 p.m. with a 7:30 p.m. Prayer Service at the St. George Catholic Church, Hartford, SD and will resume Thursday one hour prior to the service at St. Mary’s Catholic Church in Clear Lake. The Houseman Funeral Home in Clear Lake, SD is entrusted with the arrangements. Presley Paige Nielsen was born to Clayton and Pamela Nielsen April 25, 2010 in Sioux Falls, SD. Presley lived in Hartford, SD with her family, parents Clay and Pam Nielsen; two brothers and one sister, Peyton, Eliot, Sarah Beth Nielsen. She attended school at West Central Elementary. Sweet Presley was bright, happy and always infecting others with her laughter. Her blue eyes were enough to put the ocean to shame. She had blonde hair that was brighter than the sunlight with that ever present cowlick in the front of her bangs. How much joy there was in this little girl! Presley loved spending time with her family and doing a few activities such as riding the golf cart at Grandma and Grandpa Rhodys, dressing up in Grandma Nielsen’s shoes and being Sarah Beth’s side kick. Although she was the baby of the family, her stubborn, independent and persistent attitude pushed her to take charge in many situations. You’d often feel her pinching or spanking to get your attention. Her dad called her his little copilot. Some other names she got along the way were, “Pearl”, “Pepper”, “Fluffer” and of course, “Pres”. Presley had so many favorite things, especially babies. She was such a young little mother – always asking if she can hold baby Carter or baby Piper. Whenever a baby was around, that’s where you’d find Presley. She loved dressing up like a princess, playing house, painting her nails or doing her hair… all while singing or dancing. She was always on the run. We remember her boldly coming in the house, slamming the door and heading off to do something with her brothers and sister, cousins or friends! Her recent success story was riding her bike without training wheels, she was so proud to tell everyone. This world is left as a brighter place with so many blessed by Presley. Her smile was enough to cure any sadness, her personality was laced with care for everyone which she gets from her mom, Pam. Presley lived a full life in a short number of years. We will always remember her caring personality and sense of humor. Greeting her in heaven are great grandpa Arlen Rhody, great grandma Nancy Bergjord, great grandparents Ingvald & Janet Nielsen, special teacher, Mr. Murphy, and her unborn siblings. To plant a tree in memory of Presley Paige Nielsen, please visit our Tribute Store. "Email Address" would like to share the life celebration of Presley Paige Nielsen. Click on the "link" to go to share a favorite memory or leave a condolence message for the family.